Counting the likes of the ESB and LeasePlan Ireland amongst their clients, Grace’s Garage in Limerick city provide a comprehensive range of servicing / repair solutions as well as outstanding breakdown / recovery services, catering for cars and light commercials. We met up with founder / proprietor Gerry Grace to find out more about this renowned family business. 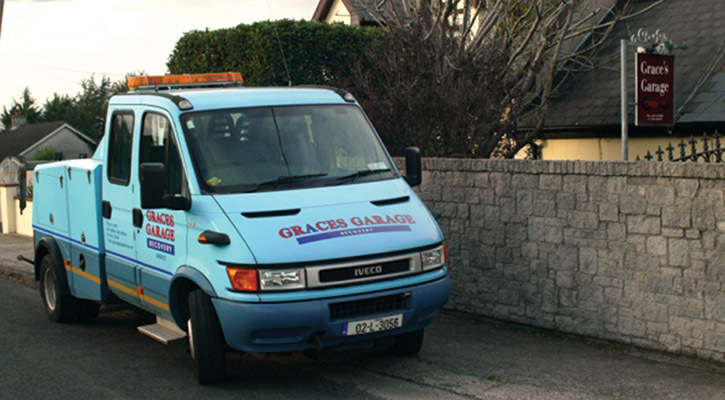 Grace's Garage is a family-owned operation that was established in Limerick city by Gerry Grace in 1983. Providing a full range of mechanical services including car, van, camper van and small truck servicing and repairs as well as exhausts, weld repairs, pre-NCT and -DOE tests and electronic diagnostics, Grace’s also offer superb passenger car and light commercial vehicle recovery solutions. Conveniently located in Limerick city, on the 512 (old Cork Road), just off the Kilmallock Roundabout, Grace’s Garage specialises in everything from oil changes and tyre checks to light adjustment, wheel alignment and engine reconstructions. They use the latest diagnostic equipment to accurately troubleshoot problems and their modern, well-equipped workshop is manned by vastly-experienced and knowledgeable technicians. Boasting over two decades of experience in vehicle recovery, Grace’s operate two recovery vehicles - one tilt and slide which can carry two vehicles and one spectacle lift truck with the capacity to accommodate up to six passengers. They can safely and promptly recover cars, vans, small trucks and motorbikes and are contracted to provide breakdown assistance for the Aria Assistance and MIS as well as selected insurance companies. The team at Grace’s Garage have a particular interest in vintage and classic cars. They have restored many of their own and always welcome any work in this area. Reflecting on the genesis of the business some 32 years ago, straight-talking founder Gerry Grace notes: “I started the garage in 1983. There was a very bad recession at the time and I had worked for a friend of mine for 18 years prior to that [Sweeney Concrete]. When he went out of business, I started up on my own. In the garage, a full range of services is provided to owners of passenger cars and LCVs. “We do repairs, servicing, engine rebuilding, diagnostics, wheel alignment etc.,” Gerry confirms. “We use Brain Bee diagnostics equipment and software and we can work on any vehicle from a car to a van or a minibus. Having been in business for more than three decades, Gerry is obviously doing something right. “You do your best to address a problem when it arises,” he concludes. “If you don’t have the best equipment, then you are wasting your time. I have invested a huge amount of money in tools and equipment over the years. On top of that, we know what we are doing and we provide a good service. Providing an array of professional services, Grace’s Garage has been going strong for over 30 years and all the signs are that they will continue to do so into the foreseeable future!